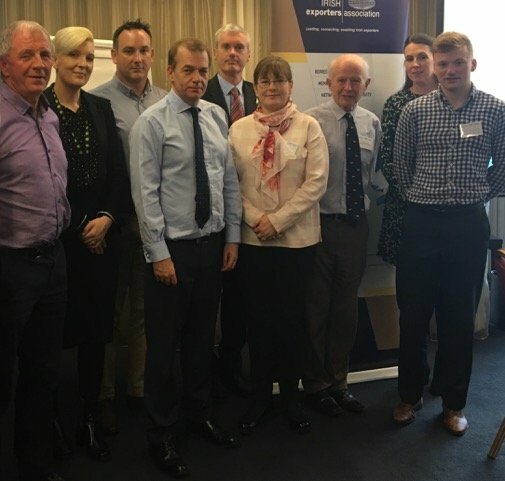 Speaking at the Irish Exporters Association (IEA) Supply Chain 2018 Series Roundtable meeting held in Athlone on 24 October last, Ulster Bank Chief Economist Simon Barry, stated that the Midlands Region had the country’s second highest growth rate in employment since 2008. Looking to threats to the Irish economy, while the uncertainty about the exact shape of Brexit has made life difficult for exporters the more critical concern is that of retaining Irish competitiveness within the EU marketplace. While the impact of the reduction in value of Sterling has been most apparent in the drop in the UK visitor numbers to Ireland, other industries are also suffering from the increase in the competitiveness of British suppliers to the European markets. 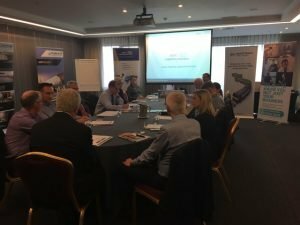 The meeting, held at the Sheraton Hotel, Athlone also discussed questions raised about the appropriateness of use of the UK Landbridge to ship goods and services to and from Continental Europe. Issues raised included cost, driver shortages, environment and lack of information about direct services. 8 November 2018 at Rosslare Europort, Wexford and in Dublin on 7 December. Among the event sponsors included Rhenus Logistics Ireland, Ulster Bank, Iarnród Éireann Irish Rail and Fleet Transportas media partner. Zero-emissions heavy duty truck heading to Europe!